May 5, 2003 Walter Max Ulyate Sisulu, South African anti-apratheid activist, died. Sisulu was born May 18, 1912 in Engcobo, South Africa and moved to Johannesburg in 1928 to work at a number of manual jobs. He joined the African National Congress in 1940 and in 1943 became the treasurer of the ANC Youth League. In 1949, he became Secretary General of the ANC, a position he held until 1954. Between 1953 and 1963, Sisulu was jailed seven times and in 1964 he was sentenced to life imprisonment and, along with Nelson Mandela, spent the majority of his sentence at Robbins Island. After 26 years, he was released in 1989 and in 1991 was elected ANC Deputy President, a position he held until 1994. In 1992, Sisulu was awarded Isitwalandwe Seaparankoe, the highest honor granted by the ANC, for his contribution to the liberation struggle in South Africa. 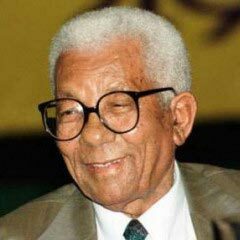 Walter Sisulu University in the Eastern Cape Province of South Africa is named in his honor. “Walter and Albertina Sisulu: In Our Lifetime” was published in 2002.